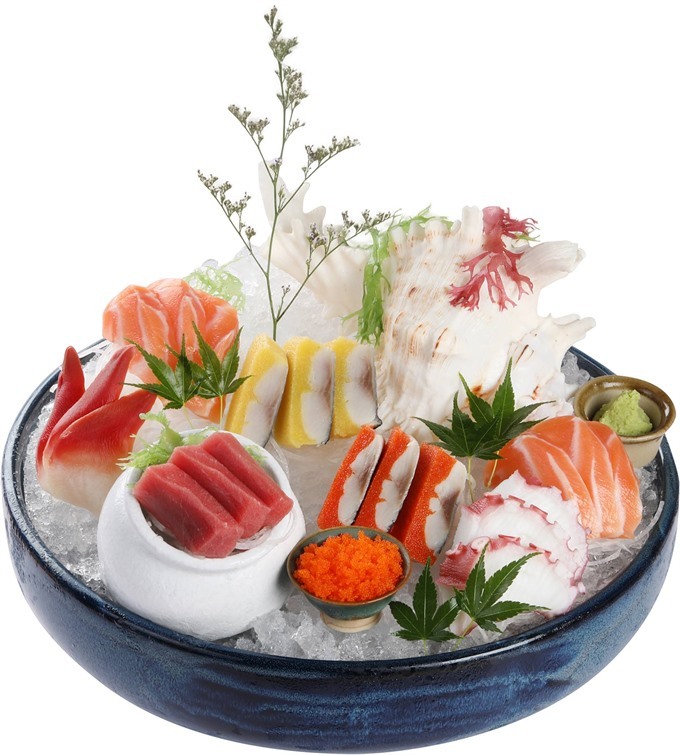 Sashimi—the queen of Japanese cuisine which stands alongside Italian Pizza among the world’s symbol of gastronomy. Japanese food is known throughout the world for its unique flavours and textures, but without the right tuition, it’s difficult to really appreciate what’s on your plate. Hồ Hoàng reports. HÀ NỘI — Perhaps it’s kind of unnecessary to discuss how delicious Japanese cuisine really is as it’s widely recognised as one of the world’s finest cuisines. But have you ever wondered why sashimi isn’t your taste yet? Is it because you can’t stand raw food? Or maybe you aren’t eating it the right way? Well, after a memorable dinner at Hatoyama with my Japanese friend Akio Hirano – a sashimi addict, I found out that I’ve been eating Japanese food in the wrong way for so long and in some ways maybe some of us can relate to this. Trust me, it will bring a whole new sensation trying it the right way. Hatoyama’s new restaurant is located on the 4th floor of a luxury shophouse at 30 Nguyễn Chánh Street with an elegant design, decorated with a big tuna, modern lighting, parking and polite security guards who organised our vehicles without asking. Our first impression was really relaxing. Behind big glass doors, there were two receptionists wearing beautiful kimonos waiting for us. Hirano was really pleased with the way we were served. “Very polite and respectful,” he said. We were delighted with the design and decor of this new restaurant, with luxury yellow lighting blended with traditional lanterns, the whole place looked so vibrant, but not too much exposure. There was also a “feng shui” rock in the middle of the hallway surrounded by beautiful white gravel. Everything seemed perfectly matched. From the hall, there are traditional Japanese sliding doors which lead diners to 13 different dining rooms with several private ones for special guests. Every room has an elegant design with big traditional paintings and luxury bottles of sake standing shiny inside glass caskets. “The second restaurant is designed in Wabi Sabi style, inherited from Buddhism and directs people to a peaceful beauty of disproportionateness and rusticness,” said restaurant manager Đinh Quang Minh. Our meal started with typical edamame (Japanese beans) and ginnan (ginkgo nut), which were really fresh, greasy and flavourful. “Don’t call them appetisers, it’s about to come out,” Hirano told me when I asked how delicious they were. I felt kind of weird, but well, he’s Japanese, right? I was stopped by Hirano when I was attempting to mix the wasabi with the soy sauce like most other people. “Mixing wasabi in soy sauce will reduce your appetite. 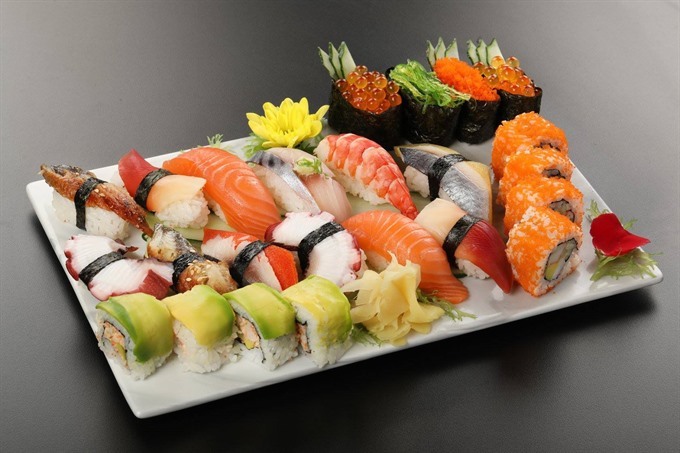 The wasabi is there to boost your taste, you should only add a little bit of it to the sushi or sashimi, then slightly dip the raw fish into the soy sauce, that will perfectly organize everything into its right order,” he said. I knew the sashimi was only the beginning of the party, so I was surprised by the price (between VNĐ1.45 million and VNĐ4.75 million), but agreed to order the “Sashimi Moriawase No 2” featuring raw Akami tuna belly, carangidae, oysters, octopus, herring, salmon and salmon egg with sea weed and perilla leaves. “The Akami tuna belly was taken from the very expensive blue fin tuna, while the carangidea is a symbol of autumn in Japanese culture. The salmon and perhaps most of the ingredients, especially the raw ones, have to be imported from Japan within 24 hours,” one of the waitresses told us. A big set of tasty sushi attracting its lovers so much. You can also roll the fish in sea weed and perilla leaves. What I was really impressed with was the leaves. Normally, they come in green and purple, but these leaves were a vivid green, which raised my curiosity. “The two-coloured perilla is from Việt Nam while the one you just enjoyed is another kind which is imported from Japan, that’s why it’s quite expensive,” the manager explained. At that moment, we knew we’d made the right choice. When we tried a toast, Hirano stopped me once again. “Don’t use one hand, we Japanese always use two hands for pouring tea, sake and we use two hands to show our gratitude to others. The left hand is for holding the bottom of the cup,” he said. Later on, we had mixed Japanese salad for VNĐ210,000 – another trademark Japanese salad with various kinds of seaweed, green grape seaweed and yellow shrimp eggs. The mixed Japanese salad is like a four seasons garden. It’s also highly recommended by experts as a natural medicine for aging. "Authentic until the very last leaves” is a definition I give to Hatoyama after discovering the story behind these perilla leaves. It’s great to know how meticulous and professional the leaders of Hatoyama really are. "We take super good care for the food we serve to customers, even from the smallest leaf," according to Chef Kyo Nguyen, who has more than 20 years experience in the trade. Comment: Quality steakhouse with great professional service in a nice venue. Reservations are highly recommended.